Saunas are awesome if the heat relaxes you. When you have a sauna at home, you can literally have that melting feeling all year around, whenever you feel like it. But how hot does a sauna get, and what is the ideal average sauna temperature for the different types of saunas that exist? Saunas can reach very high temperatures because they are able to strictly control one thing: humidity. Unlike steam rooms (steam saunas), which warm you up with high humidity, saunas create a very dry heat. As a result you can stand much higher temperatures in a sauna than in a steam room. The purpose of the dry heat from a sauna is to make you feel like you have a fever – so you can sweat out toxins and impurities through your skin. Traditional saunas (Finnish saunas, smoke saunas), infrared saunas and steam saunas (steam showers, steam baths, steam rooms). 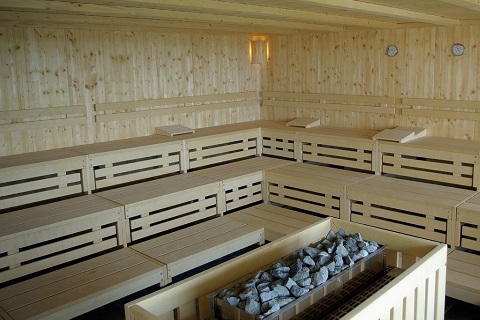 Traditional Dry saunas and Smoke Saunas build up warmth from heating up sauna rocks which heats up the air in the room. The temperatures for traditional saunas typically range from 150 to 190 degrees Fahrenheit (or 66 to 88 degrees Celsius). Originally these types of saunas would use a wood burning stove to heat up the rocks (and in fact smoke saunas still do). Most modern dry saunas however will use an electric heater to heat up the rocks, which radiate heat through the air throughout the room. The electric heating elements turn on and off automatically to maintain the sauna temperature you have set until you turn it off, or until it times out. Many modern electric dry saunas will have a safety switch which will turn off their heaters at 60 minutes, but the heat will remain for some time afterwards for you to enjoy. A traditional dry sauna usually requires a few minutes to heat up to your required temperature from a cold start – this heating time will be dependent on your particular model. One of the advantages of a traditional sauna is that you can introduce humidity by pouring water over the rocks. This creates a burst of steam, which may make it easier to breathe, and may feel more comfortable for your skin too. Infrared Saunas work in a totally different way to make you sweat. Infrared Saunas generate infrared waves, which safely penetrate your body and raise your core temperature. These waves emit infrared energy which is on a similar wavelength to the energy which the human body naturally emits – which is approximately 7 – 14 microns. The result is the same – your core temperature is raised and as a result your body sweats, your muscles and joints are more relaxed. The main difference is that an Infrared Sauna can create the same experience as a dry sauna but at a lower temperature range, usually between 80 to 130 degrees Fahrenheit (or 26 to 55 degrees Celsius). This is because the infrared waves are heating you up from the inside out, whereas a traditional dry sauna relies on the hot air to warm you up from the outside in. Steam saunas (or steam rooms, steam showers, steam baths) work very differently from Traditional or Infrared saunas. Steam saunas warm you up with high humidity instead of with dry heat. Steam Rooms are heated up by a steam generator that boils water, turning it into steam, and continually releases it into the room. 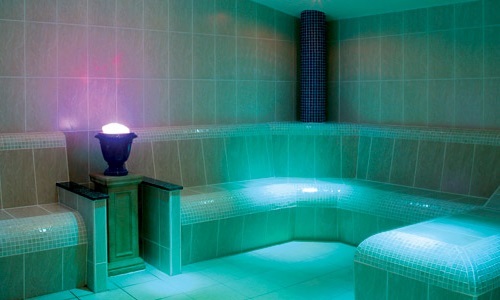 Steam rooms are kept airtight, so that the humidity level can reach 100%. The temperature in a steam sauna typically is lower than in a traditional sauna, but it can actually feel much warmer due to the humidity. This is also very much a personal judgment. Some people prefer dry heat, others prefer moist heat. Being in a sauna by yourself or with a partner can be a relaxing (or possibly even romantic) exercise, but with a big group of people it can be much harder to relax. When you have many people in a sauna at any one time their body heat will also contribute to the overall temperature of the room, not to mention that the lack of personal space can make the experience less enjoyable. Having a large group of people in a sauna can also be a bit of fun too – it often degenerates into a competition for who can stand the heat the longest! In fact, in some countries where saunas are very popular, competitions are held where the winner is the one who can withstand the highest amount of heat for the longest period of time. The Annual World Sauna Championships were held in Finland from 1999 to 2010, with competitors entering from over 20 countries. Unfortunately, the Championships were cancelled in 2010, when one Russian competitor – Vladimir Ladyzhenskiy – died trying to withstand 110 degrees Celsius (230 degrees Fahrenheit) after six minutes. The reigning champion, Tim Kaukonen, also had to be dragged from the sauna and suffered severe burns as a consequence. Europeans and Russians can typically handle hot temperatures better than Americans can, because saunas play a big part in their culture, especially in Northern Europe. In these countries it’s allowed for saunas to go above 200°F. In the USA and Canada however, the maximum sauna temperature sits at 194°F (90°C). Sauna heaters often have high-temperature limit switches that control the maximum temperature for safety reasons. They typically also have timers installed so that sauna heaters turn off automatically after a certain time period. Even if you adore the heat, it doesn’t hurt to be a little bit cautious as things can go wrong very quickly in a sauna at high temperatures. Building up the temperature gradually is the safest way to enjoy your sauna session, as it gives your body plenty of time to adjust. Keep your body still and relaxed, as this will help keep your internal body temperature from rising dramatically. If you are doing a long session, taking regular breaks is essential, as well as staying hydrated. Falling asleep in a sauna can be very tempting too when you are warm and relaxed, but this is a definite no-no, think of it like falling asleep in an oven! If you feel dizzy or nauseous, it’s definitely time to bring your session to an end, as you might be feeling the first signs of heatstroke. In conclusion, saunas can get very hot depending on the type of sauna you are using, and also depending on the length of your session. It’s important to select the best type of sauna for your style of relaxation, and to learn the best way to have a happy and healthy session every time. The ideal sauna temperature is essentially a personal choice. Always be cautious when entering a sauna and be prepared for very high temperatures. Saunas are there for enjoyment and relaxation, not for discomfort.